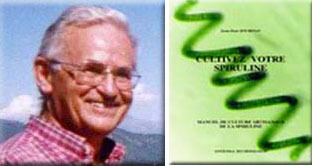 For many years, Jean Paul Jourdan, author of Grow Your Own Spirulina, developed small scale spirulina projects in Europe and Africa. In his practical manual Cultivez Votre Spiruline, he describes how to grow on a family scale. Since 2002 Jean Paul has edited a monthly newsletter called Petites Nouvelles de la Spiruline. From 2004-2008 he was professor of spirulina culture at the CFPPA Center in Hyères, engaging many of the future spirulina producers who number more than 50 in southern France and as far north as Brittany, Savoie and Alsace. He is a consultant to the Fédération des Spiruliniers de France. The Future of Spirulina Microfarms: A conversation with Jean-Paul Jourdan. Jean-Paul is the author of “Cultivez Votre Spiruline” (Grow Your Own Spirulina), pioneer of small scale spirulina farms in developing world countries and microfarms in France. At Eco Domaine Farm in Normandy, he describes his personal home microfarm as well as the future of the spirulina microfarm movement in France. 3:35 minute video of The Future of Spirulina Microfarms. (2011). 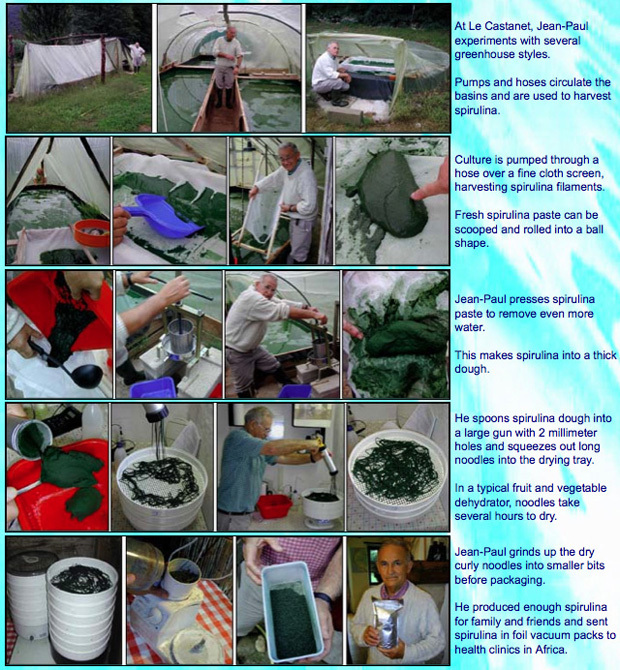 At his spirulina greenhouse microfarm at Le Castanet, in Mailet France, Jean-Paul Jourdan demonstrated how he grows, harvests and dries spirulina, producing a tasty finished food product.